Never had the best eyesight (okay, blind as a bat) but once I hit 60, I couldn't see anything without a floodlight. My optometrist told me about Over 40 and I have told at least a couple of dozen others. It is the most-used app I have, great in restaurants and to find things on dark floors and carpets, read tiny numbers on keys and locks, etc. LOVE IT! Great because I often forget to bring with me my new reading glasses, but I always carry my smartphone. This has been a great help when trying to read menus in dimly lit restaurants. Perfect for reading food labels! And I love that I can take a pic of it and then blow it up even more. Great app! Bought this because my eye doc told me about it. It does not help, focuses in too small, does not take place of reading glasses. As my husband pointed out, you would be better off taking a picture of menu or what ever you need to read and then enlarging it slightly on your iPhone. No need for the ap. Works as expected. Very convenient. After you paying and opening the application you will aware that there's ads enabled all the time. If you want to remove them, you need to pay again!! After making this mistake, I was aware the there are other ones better, cheaper and you not need to pain again to remove the ads. Pay for an app only to get an option to pay for the apps to be turned off. I bought an earlier version of this. Paid for the ads to be disabled, only to have them reappear when I replaced the phone. This turned my iPod into a magnifying glass, perfect for people that need reading glasses. This app should be a system app because of its usefulness. Tried deleting and re downloading. No magnifier view, no light. Locks up on screen suggesting I buy no-ads version. Doesn't even allow me to click to buy no ads. Based on other reviews I wouldn't anyway. Used to be a good app. I had never thought of this before but if you need reading glasses then this is the app for you. It is a very easy to use magnifying glass for digital reading. Especially if you read in the dark this could be very helpful to you! Having paid for the app I found it disappointing to have to pay another fee just to get rid of a single ad. And so with every ad you have to pay another fee to eliminate that ad. Nice features. But it really hstinks that after paying for the app it is asking for more payment to disable the ads! Even though it's a pay version doesn't mean you don't get ads. It will cost you another $1 to permanently remove ads. OK. Nothing special. The app used to work but doesn't anymore. In addition to paying for the app you have to pay more if you don't want to be bombarded with ads. This wasn't an issue with previous versions. Very disappointed in new product. I love that you can quickly see something small and and move it around without having to use memory on your phone for a photo. Also loving the tip calculator the UI looks great!! This over 40 app is a definite must download for those of us who wear reading glasses. Sometimes I do need a magnifying glass and to have it right at my fingertips is awesome. I wish they came out with this app a lot sooner. Great job. Why I love this app? It's because I can use this one as my reading glasses. This is a good magnifying glass. I can even use this as my macro lens as it can zoom and magnify close to my subject if I'll use it in taking photos. I've got to use this app from now on. Small print, loose screws in one's specs ... all of that. I've used a variety of magnifying apps over the years, but this one is by far the best. I was initially somewhat skeptical as to its utility, but was pleasantly surprised to find that it will become an indispensable app in my daily life. It is a very simple app, but the features it has are so well conceived and intuitive that it easily merits a five star rating. Well done! For years, this app was one of the indispensables on my iPhone 4s. Now, with the last automatic "update," you've taken it away. From me. Please, please, please issue a downdate so we millions of users with older IPhones can have it back. Works great and, I especially love the slider zoom feature as well as the flashlight. Don't buy this! !Too many ads!! Once you buy this, they'll hound you with ads while you're trying to use the darn thing until you upgrade to the "ad-free" version. Extortion!! Seriously, people, do you think this 54 year old is your target audience for the "Game of War" app?!? Scheisters!! I use to love this app. Then it just stopped working. I tried redownloads and restarts. No help. Fix you app. Picked this up after seeing someone use it. Was not aware he had paid for no ads. Wasn't aware of the ads before purchasing. Imagine my surprise when one of the first dialogues that popped asked if I wanted to pay for no ad version. Would never buy again. Apps should be either paid or ad supported, not both. It does what it says, it's a quick magnifier and flashlight at the same time. Worth the money!!! This is one of my favorite apps and I use it several times a week and I tell everyone I know about it! 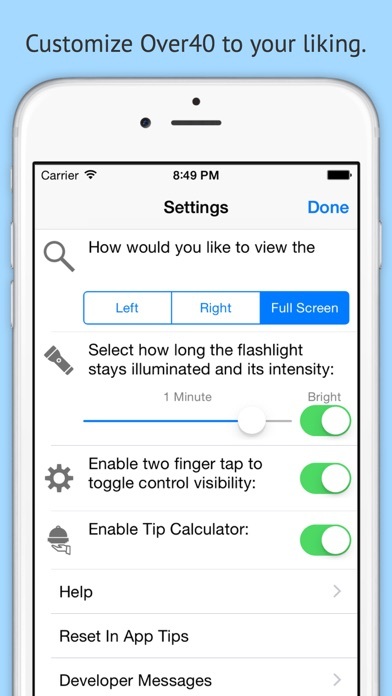 This app combines your phone's camera and flashlight, and a tip calculator into a single utility. The app has ads that you can get rid of by paying more. Not worth it. Instead just take a picture of what you want to see (a menu, a label, etc) then view the picture, zooming in as necessary to read the print. That's all this app does anyway. over 40 magnifying glass with flashlight - magnify menu reader and book reading glasses wow just awesome. i just looking for flashlight apps come across this one free. i like this app. And I tell/show everybody. Most download it on the spot. New version is working for me! I like the new menu and it’s working great on my iPhone 6+. Thanks for the new features! Great app for the visually impaired! I absolutely adore this app! I'm visually impaired, way under 40, and use it all the time. Thanks so much! Note: As of April 10 2016 I'm not a fan of the new icon; I liked the old one much better. I know it's a superficial thing but just thought I'd mention it. Perfect when trying to read that instruction document included with your latest electronic purchase that was printed in a 1-point font. I did rate this this app a 4, but now - 2 (and I'm being nice with that). I paid for no ads - and I STILL have ads. Skip this one. The newly released version (as of 04/10/15) is busted. It crashes immediately when trying to start up. This is on an iPhone 4S, running iOS 7.1.2. Baaah ... Newer version (3.0.1) now works on iPhone 4S with iOS 7.1.2. Thanks !! This works well not just as a magnifier but also in reverse mode as a hand held mirror. Over 40 App is A Godsend. My husband and I both have poor eyesight. The Over 40 magnifying glass App is a Godsend. We don't always remember to carry our reading glasses; but we always have our IPhone. This is really useful when we are in a restaurant struggling with the menu. It also has a tip calculator and a flashlight. Very highly recommended App! 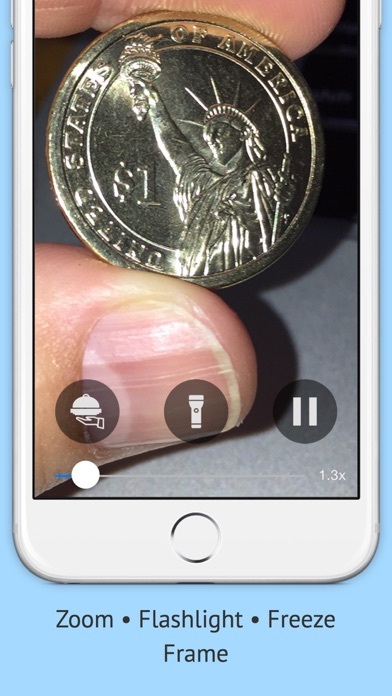 This is a great app for looking at anything that you can't see normally. I don't even need reading glasses while using this app and I must say it is a great magnifying glass. Overall a great app that is easy to use and has a great interface. To get ads after paying $1.99 for this app? Will be requesting refund from Apple. Very greedy.